In his latest show One-Headed Beast, David Huntsberger brings together stand-up and animation to create a comedy show with a very unique feel. Rather than just seeing the performer on stage, David’s show utilizes a projection screen to display vivid animation full of abstract and beautiful images that correlate to the material as it is happening. This creates an immersive atmosphere that is truly unlike any other comedy experience. You may have seen David on Amazon’s One Mississippi or as the host of Syfy’s Reactor. 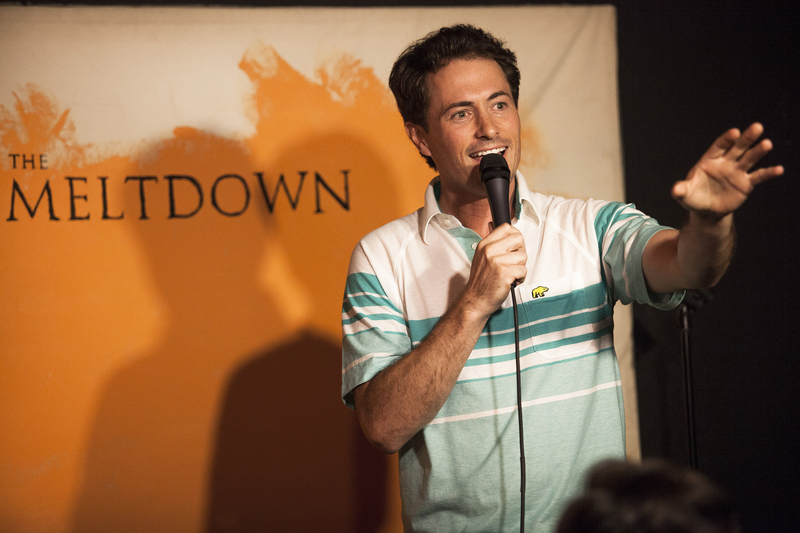 He has been a guest on numerous podcasts including Marc Maron’s WTF, Doug Loves Movies, Alison Rosen is Your New Best Friend, and he was a host of the popular Professor Blastoff podcast, which debuted at #1 on iTunes, with Tig Notaro and Kyle Dunnigan. As a comedian, he has released three CDs and toured all over the world. “Space Cave Podcast” Bonus Show – In the busy world of academia, students rarely get to see their professors outside of a classroom or office hours. If they’re lucky, they’ll awkwardly run into them at the grocery store or something along those lines. But we can fix that: as an add-on to his comedy show, David Huntsberger can host an episode of his Space Cave podcast on your campus. Space Cave is an interview-focused series where David meets with PhDs from your campus and picks their brilliant brains about what they know, how their field of study might impact the future, and what they think this whole great world is all about. It’s casual, relaxed, and, when done on campus, it gives students a fresh opportunity to see one of their professors in a new light. Want to talk with us about David Huntsberger?